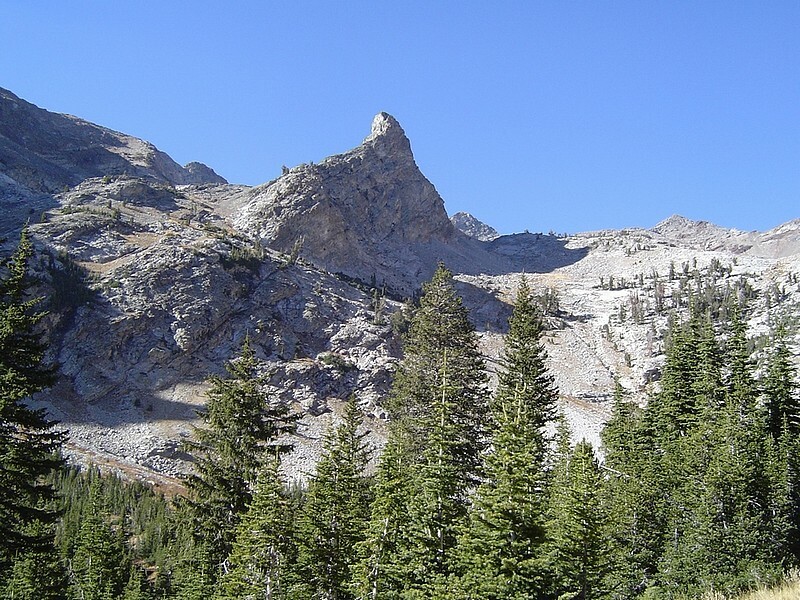 Big Basin Peak is a tall (11510') peak located north of the Big Basin area in the Pioneer Mountains east of the Ketchum - Sun Valley area. 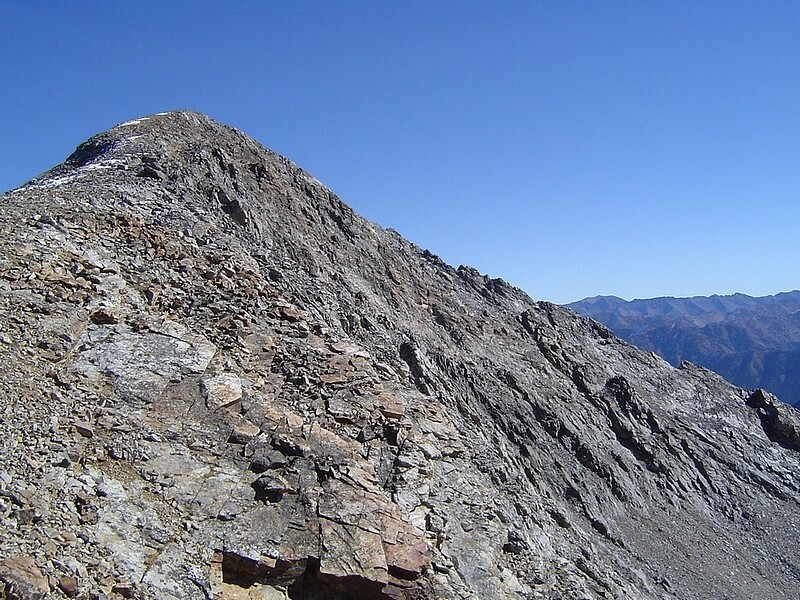 The peak isn't climbed often but the standard route follows the Class 2 west ridge up from the saddle below Old Hyndman Peak. But that wasn't the route we used... 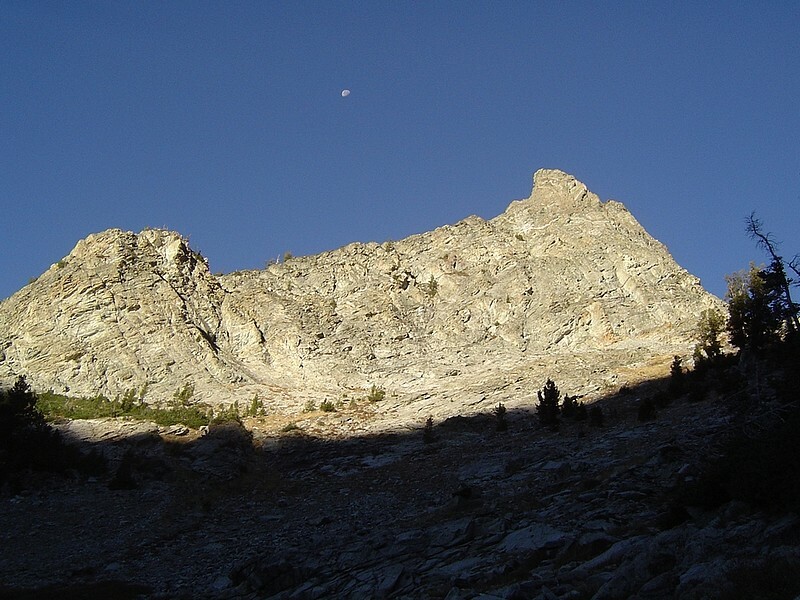 The length of the standard route was a bit too long, so Dan came up with the idea to follow the south ridge after hiking in to the headwaters of the east fork of the wood river. Dan and I met at the highway 20/75 junction at around 7am then picked up Sean at the beginning of the east fork road. From there, we continued past Triumph until the point where the road ends, not too far north of the PK Pass trailhead. We were pleased to find that the early season snow from a couple weeks earlier had all melted, so it looked like we'd have a dry day. There was a good trail for the first couple miles along the river, which was only a creek at this point, We left the trail as it began to climb steeply up to the northeast and Johnston Pass. 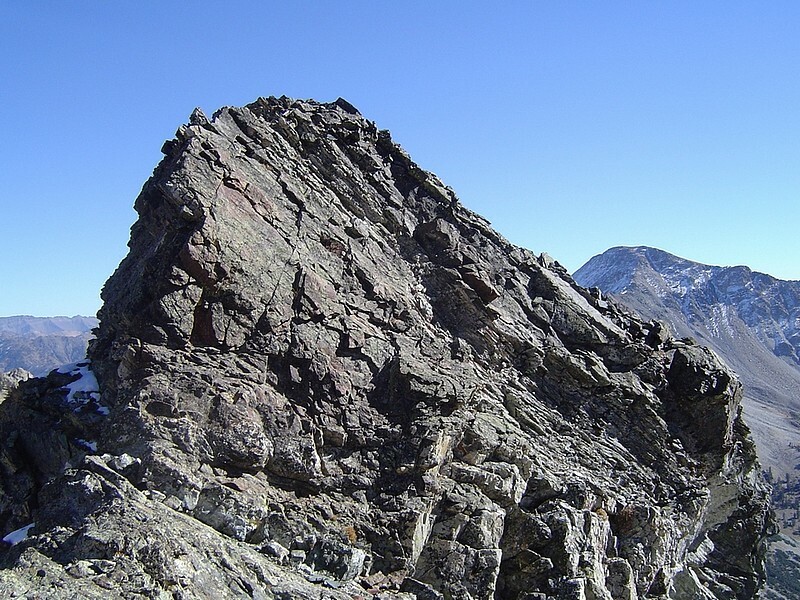 From this spot we had a great view of a cool looking rock feature called "The Little Matterhorn" (10265'). 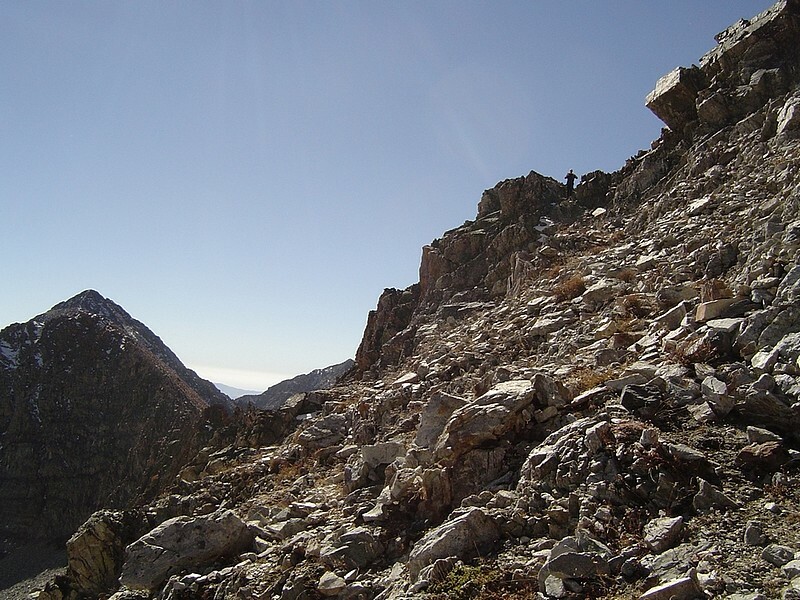 The cross country travel got steeper as we climbed into the cirque east of the Little Matterhorn. Once at around 10,000', we had a good view of our destination, and decided to go west and then north to gain elevation. 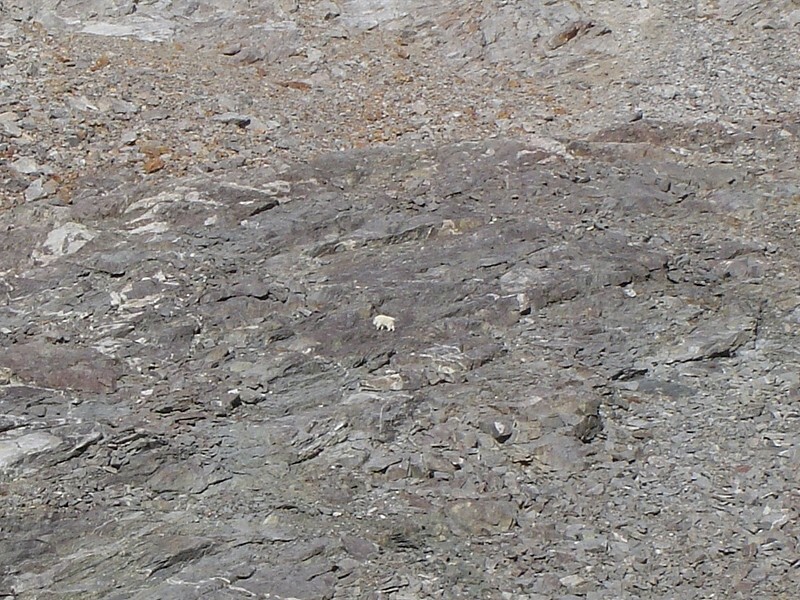 As we were climbing, Sean spotted a mountain goat. He watched us for a while, then climbed up and over the ridge out of sight. Looking up at the south ridge of the peak, we could see a couple notches and opted to head for the higher of the two to avoid some cliffs. 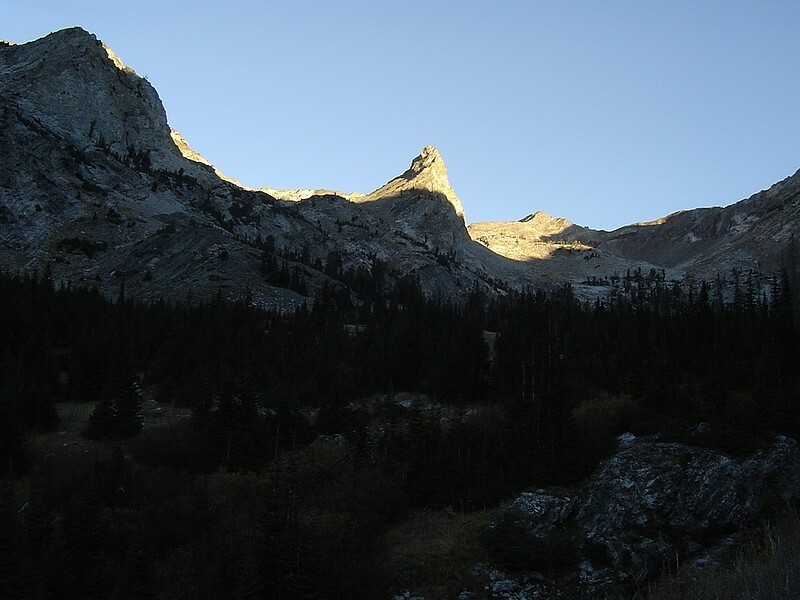 Once up in the notch, we could see down into Big Basin to the west with Cobb Peak in the background. 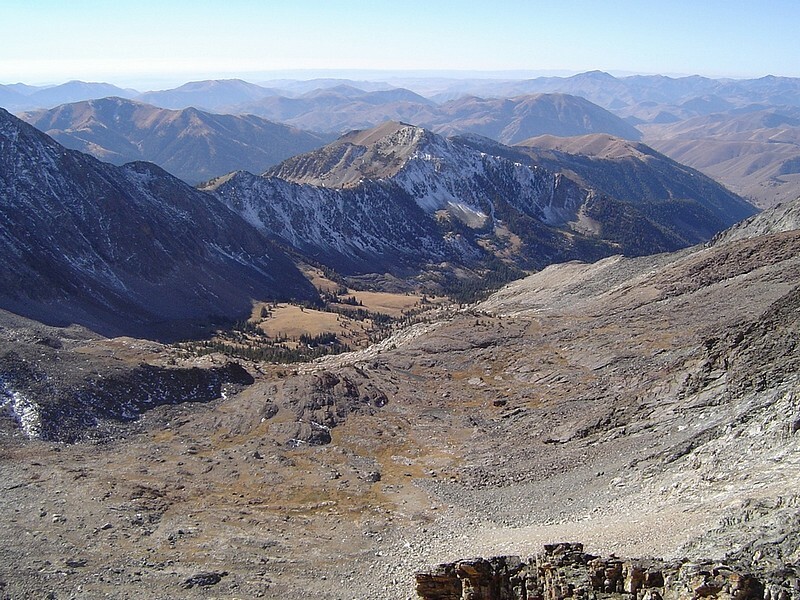 From here, we dropped off the ridge a bit to the west, then snaked our way up the ridgeline. The rock was generally stable, and the scrambling was steep, but a lot of fun. 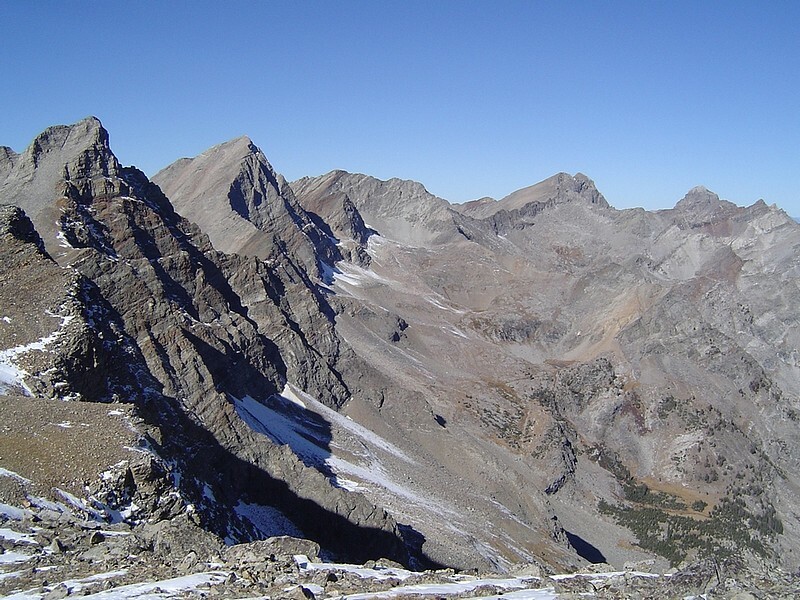 Once on the summit, we were rewarded with awesome views in all directions, with the highlight being "The Pioneer Triumvirate" of Cobb Peak, Old Hyndman, and Hyndman Peak. In the distance, The Devil's Bedstead was also very cool. We took in the views for a while, then discussed our descent route. Somehow, Dan and I convinced Sean that the best option would be to head down the west ridge, then traverse back to the east above Big Basin. This turned out to be a bad idea, as there was a ton of scree to fight through, and then we still had to climb back up to the notch before dropping back down to our trailhead. It took forever, but we made it. On the way back down, we decided to climb the Little Matterhorn. Sean went first, and I followed. 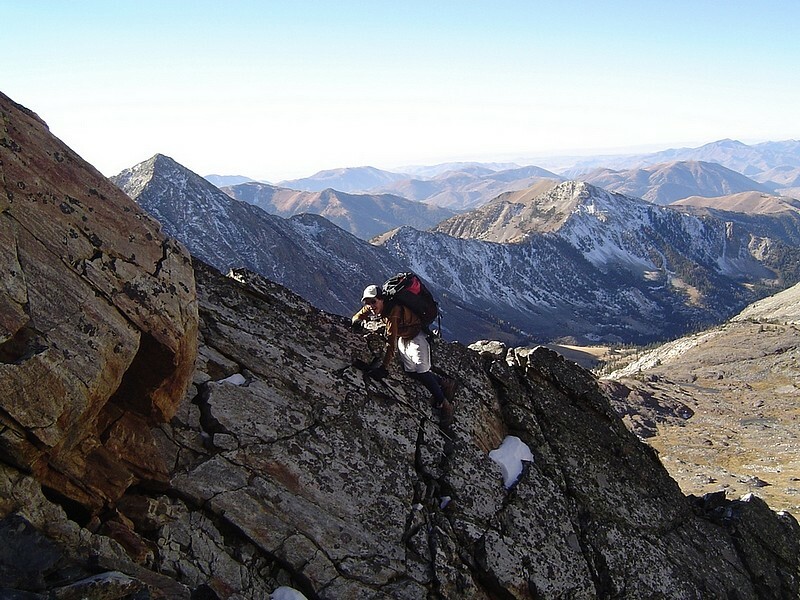 It was a knife-edge ridge that make my knees quiver as we traversed out to the highpoint. Dan opted (wisely) to skip out on this last part. After that, we retraced our path back to the truck, enjoying the awesome fall weather. A profile shot of the Little Matterhorn taken from the east. 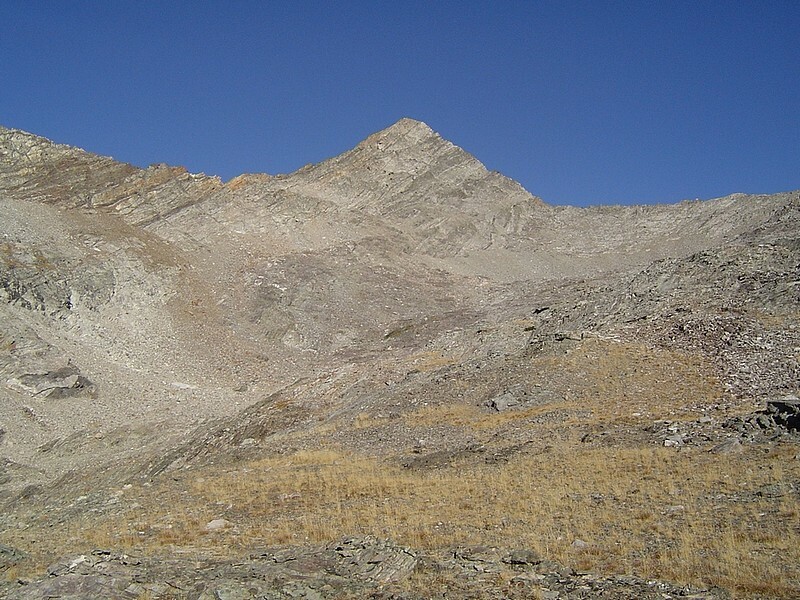 View of Big Basin Peak's steep east face as seen from near the Little Matterhorn. Mountain Goat we spotted on the east face of the peak. Sean beginning the climb up the south ridge of Big Basin Peak. 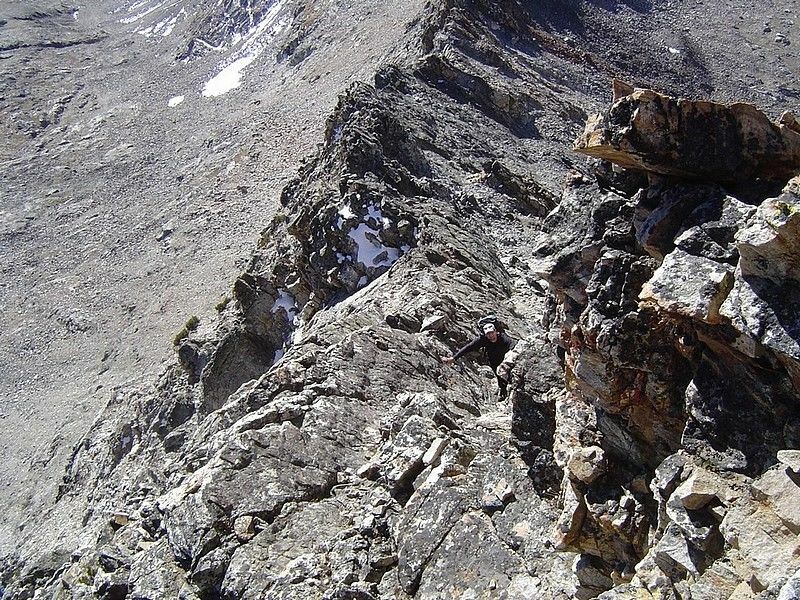 This is Sean tiptoeing along a slot, an early Class 3+ move on the south ridge. Dan trying to figure out how I got up there (snuck around the rocks to the right). 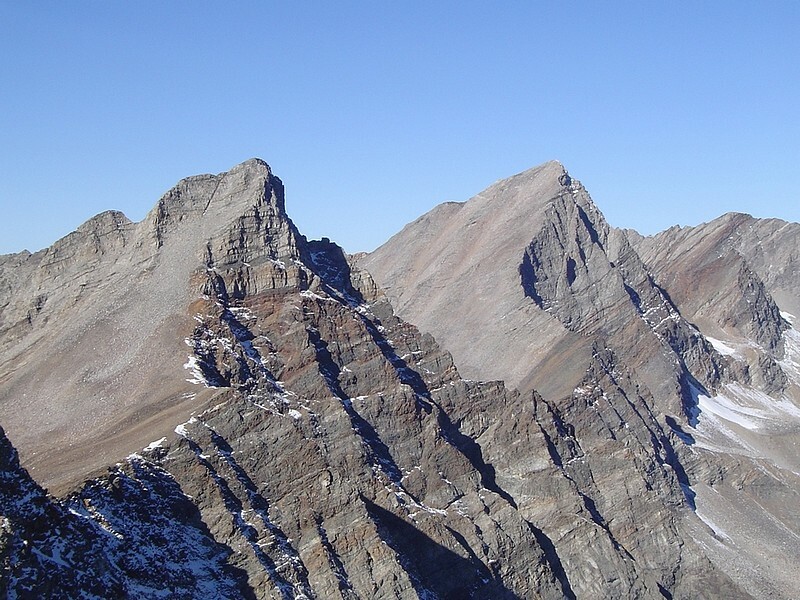 The nearly vertical east face falls to the left. Sean scrambling up the final stretch to the summit. 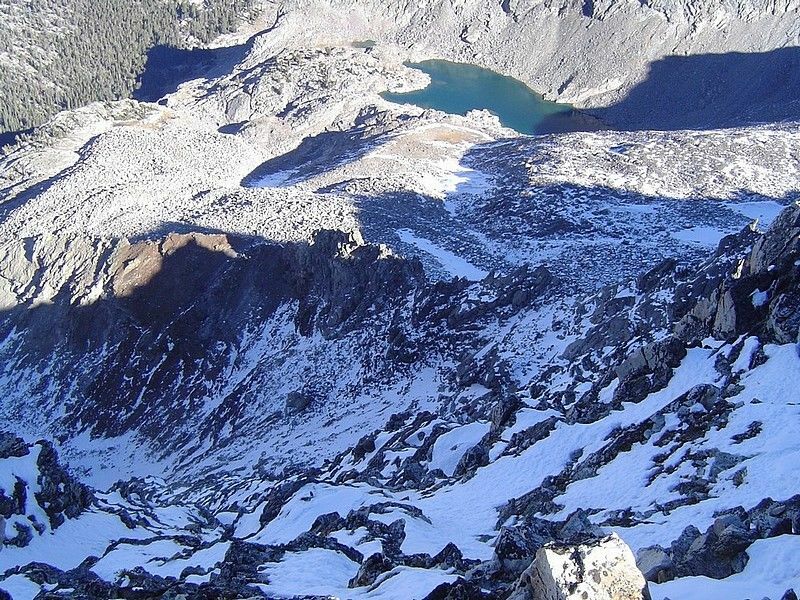 Looking down to Arrowhead Lake to the northeast of the summit. 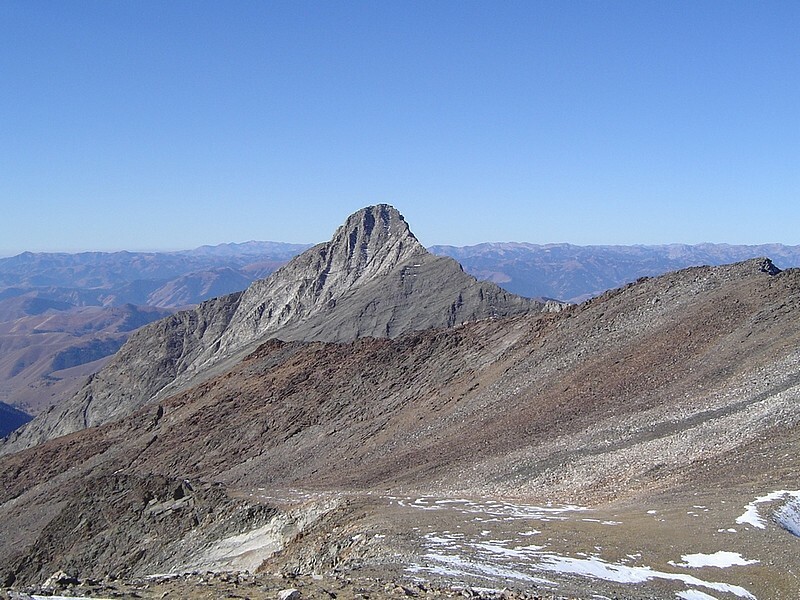 A shot of the impressive Cobb Peak, which lies southwest of Big Basin Peak. 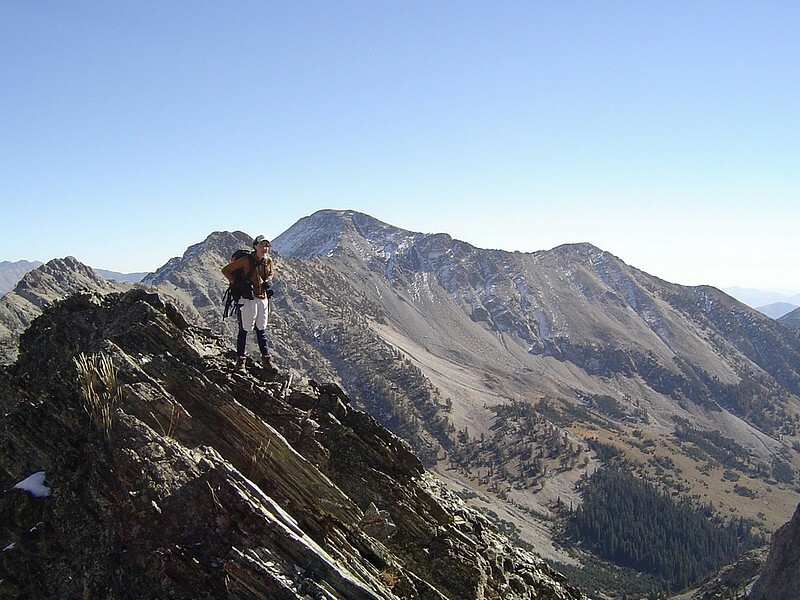 Big Basin Peak provides a great vantage point for viewing Old Hyndman and Hyndman peaks. The view back down on the Little Matterhorn. We climbed from the valley below, up through the draw just to the left of it. 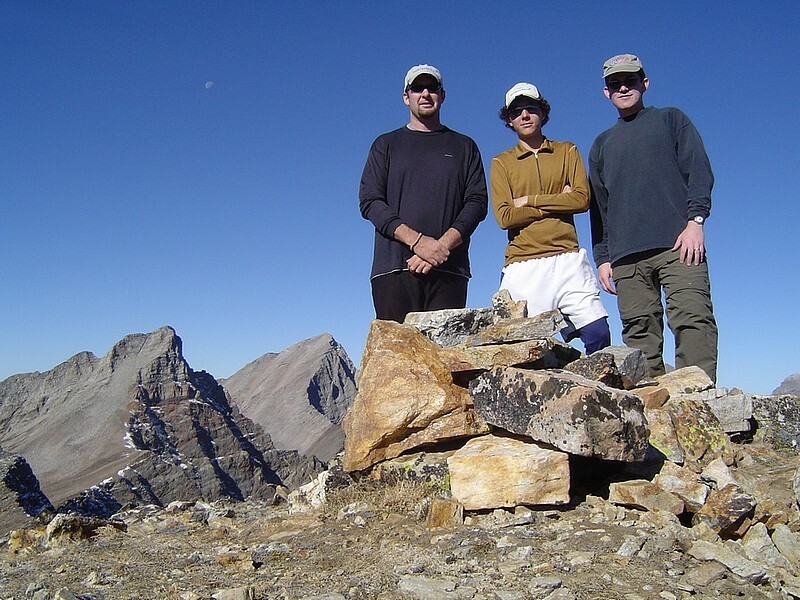 Group shot of the three of us on the summit of Big Basin Peak. 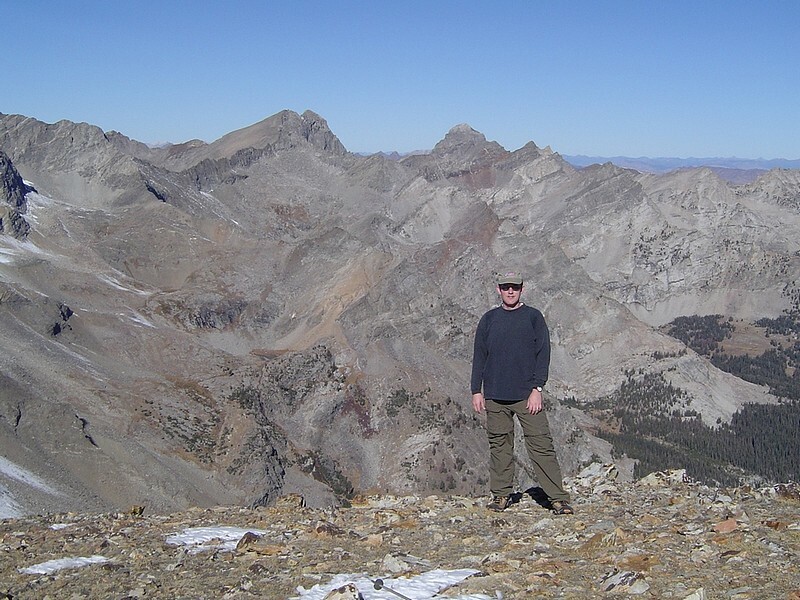 Here I am just below the summit with the Devil's Bedstead behind me. The Big Basin area lies southwest from the summit. 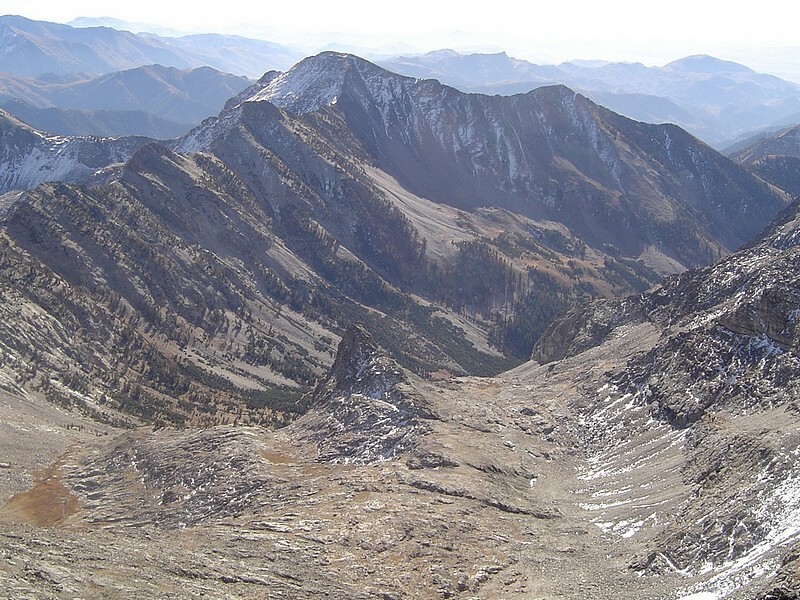 Looking west from Big Basin Peak, you can see most of the main Pioneer crest from Old Hyndman & Hyndman all the way around to the Devil's Bedstead. 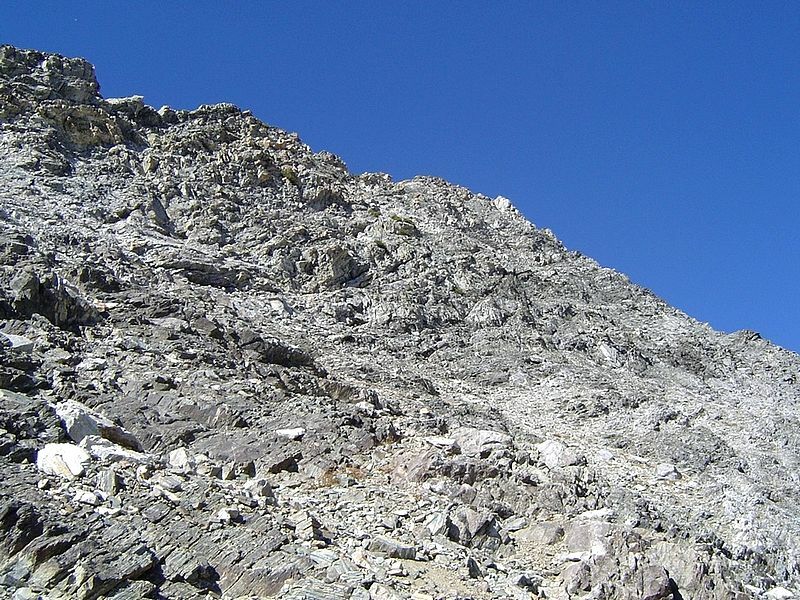 This is looking back up the fairly gentle west ridge of Big Basin Peak. 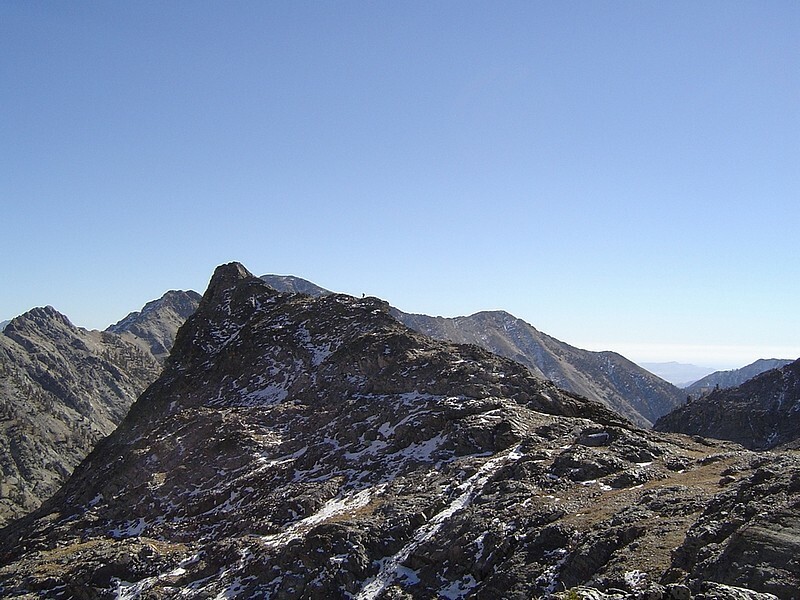 To the right you can see the much less gentle south ridge that we climbed up. Here's Dan dropping out of the notch in the south ridge during our descent. 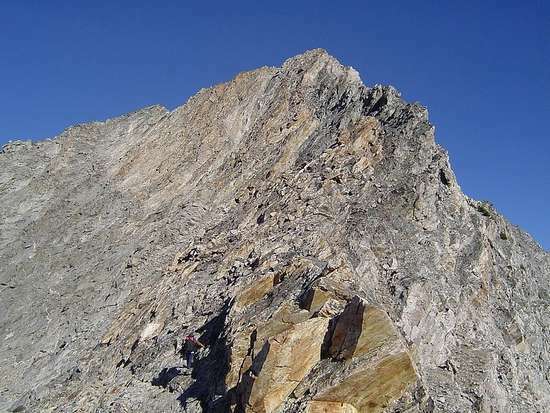 Close-up shot of the very steep east face of Big Basin Peak. A distant view of Sean climbing the ridge up the Little Matterhorn. 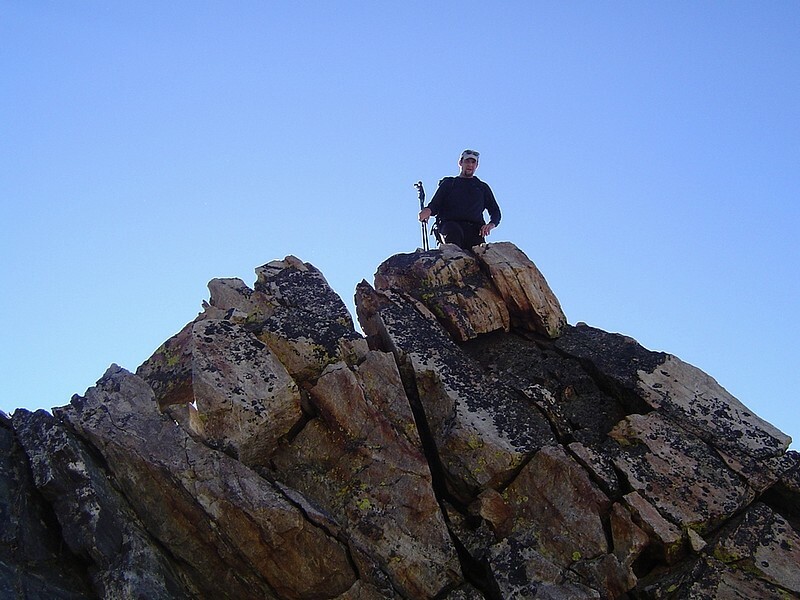 Sean standing on the summit of the Little Matterhorn. 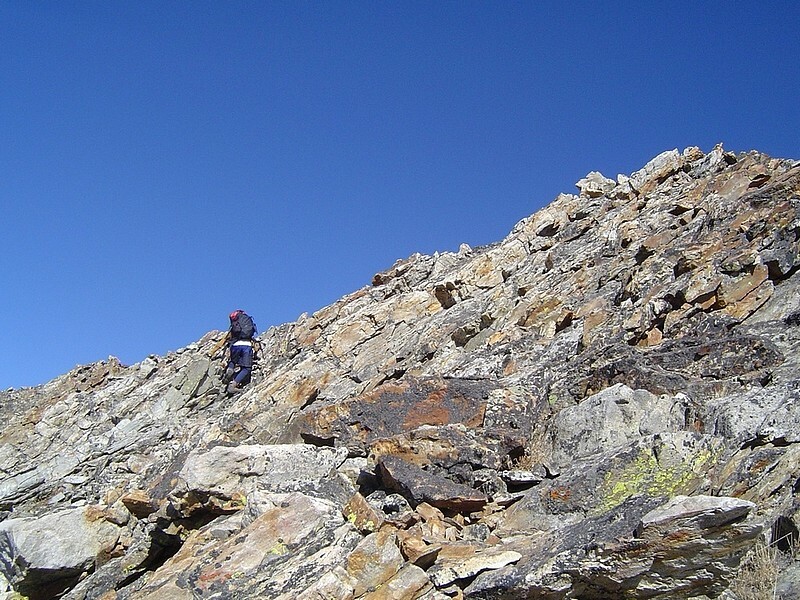 This is the Class 4+ crux of the climb up the Little Matterhorn. Another shot of the Little Matterhorn, this time on our way back out to the trailhead.